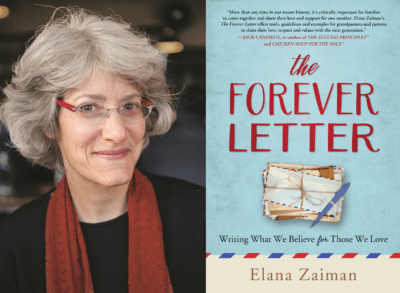 Join us for a weekend with Rabbi Elana Zaiman, author of The Forever Letter: Writing What We Believe For Those We Love. 9:45 am – Writing What We Believe for Those We Love (Shabbat Morning D’var Torah during service): Rabbi Elana Zaiman will be our guide on a journey into forever letters – what they are, why write them, and how they can be powerful tools to connect us with the people we love. 12:15 – 1:30 pm – Letters Old and New (Shabbat Tish): We will look at excerpts of letters from medieval and modern times as templates for the forever letters we will begin to craft during Sunday’s forever letter writing workshop. We will pay particular attention to tone and content; values, wisdom, and experience shared; and what does and does not resonates for us as we read these letters imagining ourselves as the intended recipients. 10 am – 12:30 pm – Forever Letter Writing Workshop: A Forever Letter is a perfect way to deepen, heal and uplift the relationships that matter to you most. You don’t have to be a writer. You don’t have to love to write. You don’t even have to know to whom you will write. The only requirement: show up and be yourself. We will talk about tone, content, and how to write to be heard. We will write two prompts to reflect on ourselves, the people we love, and our shared relationships. Feel free to bring a special notebook and pen you like to write with or your laptop.